I don't know what it is about celebrities. Honestly, I don't. Why is it such a big deal to meet them? It totally is, though!! 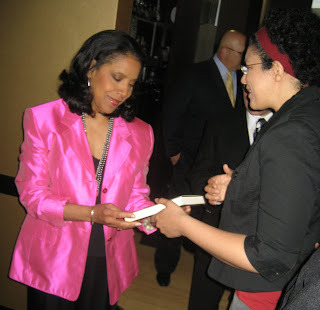 Last week, I had the opportunity to sign a copy of my novel for Ms. Phylicia Rashad, a.k.a. Clare Huxtable on The Cosby Show and star of many a Broadway show. This is an actress who I've watched and loved basically my entire life, and here I found myself in her company. Not just in the same room, but face to face with her!!! At least in my head -- I think I came across okay in real time, but WOW. I freaked out. And why? In any given social setting, I probably have five or six different conversations about myself, my work. Easy. I know the ropes. I know me. I know how to talk about my stuff. Ack! Why then do I trip over myself and get all tongue-tied when the chance comes to talk to a celebrity? I look pretty calm in the picture, but all I could do was second-guess every thought, word and motion, as if so much hung in the balance. When really, nothing was riding on the moment at all. So, again I must wonder: what is it about celebrities? Is it real? Do we overthink it? Or is it just a small world thing -- like it's hard to believe someone can be in our TV one moment and shaking our hand the next? I mean, at the end of the day, they're just people, like the rest of us. Aren't they? In the case of someone like Ms. Rashad, I'm tempted to think it's real. She's earned our admiration through her life's work -- something we all aspire to in our own ways. She was as graceful, eloquent, thoughtful and present in person as she is in her performances. She took the time to talk to me. Not everyone in her position would have. What celebrities have you met? Did you manage to play it cool?